The most beautiful sound in my life, dearly recollected, fully remembered, was the sound of a folded newspaper kiting through the summer air and landing on my front porch. Every late afternoon from the time I was nine until I was fourteen that sound, and the thump it made hitting the side of the house, or the screen-door, or a window, but never the porch-planks themselves, that sound had an immediate effect upon one person inside the house. It’s hard to imagine that today’s 9–14 year olds will recollect their childhood treasures as breathlessly. There’s your Great Stagnation. This cookbook covers the years 1840 through 1945, a time during which American cookery underwent a full-scale revolution. Gas and electric stoves replaced hearth cookery. The time of year and location became decreasingly connected to the ingredients used in home cooking; canned, bottled, and eventually frozen products flooded the market, and trains began to transport produce and meat from one end of the country to the other. During two World Wars and the Great Depression women entered the workforce in unprecedented numbers, and household servants abandoned low-paying domestic jobs to work in factories. As a result of these monumental changes, American home cooking became irrevocably simplified, and cookery skills geared more toward juggling time to comb grocery store shelves for the best and most economical products than toward butchering and preserving an entire animal carcass or pickling fruits and vegetables. I have a new post at The Calculus of Dissent taking the Pope to task about water. Freddie deBoer bemoans writing and discussing things on the internet. From my limited perspective what he describes is more of a problem for left-wing folks on the internet than for other groups, but the problem applies all over. David Friedman debunks another misrepresentation of something Darwin wrote. Darwin seems to be one of the biggest targets of this kind of misrepresentation. The other is Herbert Spencer. The FBI admits flaws in its hair matching analysis over several decades. That it happened for so long is disappointing but not shocking. That they admitted it is encouraging and shocking. I guess the pressure was too much. I covered a similar story recently. Odd notes in a 1990 NFL scouting report. Though he was not an economist Leonard Nimoy deserves an obituary notice here. 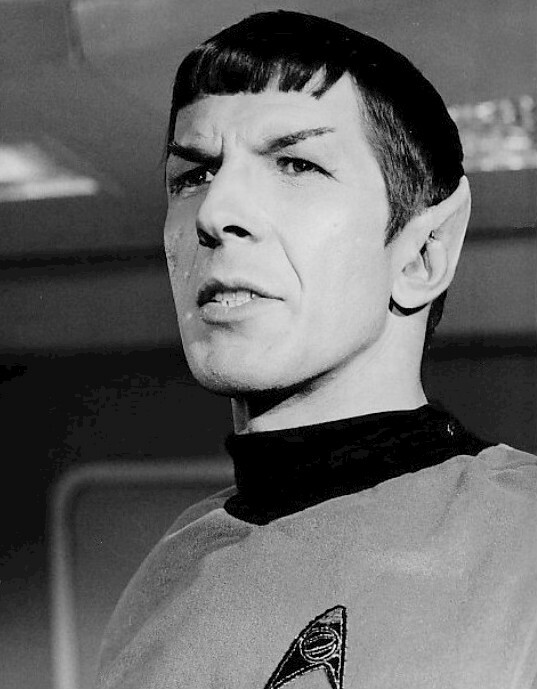 He not only portrayed Spock but brought his own interpretation to what the character should be like. The ever-logical Mr. Spock had a huge cultural impact, for which I’m very grateful. Jeff Tucker has a post on his Liberty.me page about why people leave libertarianism. As with almost all of his writing, it’s worth considering. Beyond what he said, I think there’s another reason that some people leave libertarianism. For most people getting into it—here I’m speaking from personal experience as a young libertarian and as part of the leadership of my college libertarian group—libertarianism is all about the Non-Aggression Principle. There are so many behaviors, policies, and institutions that one can find looking around the world that a) are obviously destructive and b) violate the NAP that it seems like its power as a guideline will never run out. At some point, especially once the young libertarian gets a real job, goes to graduate school, or simply starts thinking about things that young people never think about, one starts finding complicated situations that aren’t obviously one way or the other with regard to the NAP, or that pass the test but still seem problematic. You’d be hard-pressed to find a self-described libertarian seriously engaged in the field of law & economics, for example, who thinks that the NAP is a sufficient guideline. And what about the impact of broader social trends in technology or interpersonal relationships, any small instance of which may seem good but the accumulation of which might lead to undesirable consequences? A person who seriously worried about this possibility would find himself adrift within popular libertarianism, and may very well stop considering himself part of it even if he still supports all the other policies it recommends. In my own experience, many of the people who leave libertarianism “leave” but don’t go far. I like being a student of social science for just this reason. When the going gets too tough for the NAP to provide a comprehensive set of answers, there is social science. Economics, in particular, has a whole range of answers that have nothing to do with the NAP. Why is private property good? Without any reference to Locke, Nozick, or self-ownership, private property is the most efficient way yet discovered of minimizing disputes and maximizing prosperity in a modern, impersonal economy. Why is government interference in most things bad? Without any reference to Rothbard, government action is subject to a host of knowledge and incentive problems that typically result in less efficient use of resources, leading to subpar social outcomes. You can take the NAP or leave it and still come up with a libertarian worldview. I think it may come down to differing opinions on a simpler subject. How capable is society of allowing emergent orders to flourish that efficiently and robustly address universal human problems? If one takes the view that the possibilities are dim, various flavors of non-libertarian thought are the result depending on what parts of society need the most guidance from on high. If one takes the view that the possibilities are good, one ends up in the libertarian camp. Getting theoretical and empirical guidance about where on the spectrum we should fall is what social science is for; if you want to advance libertarianism, advance social science. There’s the possibility that advancing social science would hamper libertarianism, but we should be looking for the truth anyway and in my experience so far libertarianism comes out looking better and better the deeper you dig. Other people who leave libertarianism, then, are people who agree on many things but at some point reach an issue where they think substantial government direction is needed, which leads them to change their minds on some of the earlier points too. To use an unrealistically bad example, one may come to think that such widespread marijuana use as exists today really is so socially destructive that it needs to be banned by government action, at the very least to prevent its increase. With this conclusion he may go back and revisit his support for privacy from government eyes in the face of this threat. Here’s where we can make real contributions to libertarian thinking. Is that issue really so dire? Are there other ways to address it? Will the solution be restricted to the narrow problem it’s intended to address without creating a lot of collateral damage? We don’t know the answers in advance, but if people are worried about them they’re worth finding out. I know that some publications have lately taken to beating up straw man versions of libertarianism, and one of the common themes I see is that people “grow out of” libertarianism. This is all backwards from my view. The more I learn about how complex human civilization is, I think the odds of successful central management of it become exponentially harder to pull off. No expert or group of experts, no matter how smart and motivated they may be, has any substantive understanding of how most of society works. I grant that a lot of things could be better. How policies to make them better can be imposed from the top down is a separate question, one that has far fewer reasonable answers. I’m not any kind of expert in psychology, so there’s surely more to say on this issue. Speaking only speak from personal experience and observation, this is my 2¢ contribution. A decade ago we were in the middle of the “Wild West” period of blogging. Lay people could and did write serious, insightful, and interesting content alongside professors, think tank employees, and other experts. There was a lot of noise, but reblogging and links helped create a network of good blogs you could visit without ever having to trudge through the low-quality stuff. We at Catallarchy, which eventually broadened into the Distributed Republic, were enjoying every minute of it. Eventually people moved on to new jobs and new levels of education, had kids, ran out of steam, and all those other kinds of ordinary things, and today’s blogosphere is mainly done by people who get paid to think and write. I’m not complaining; it was probably inevitable. But the early period was a lot of fun while it lasted. I mention this because today is the 10th anniversary of the first of Catallarchy’s May Day: A Day of Remembrance series. The idea was to point out the failures and atrocities of communist regimes (on the day they had co-opted from the early, far less centrally-controlled workers’ movement) to make sure the romantic notions of days gone by were properly tempered by reality. It was a huge success, and we continued it for several years until we, too, shuttered the blog and moved on to other stages in life. It was so much of a success, in fact, that we no longer get the credit for starting it. I’m not complaining about that either. (Obviously, some credit would be nice, especially for Jonathan Wilde who first brought the concept up to the rest of us at Catallarchy and to others in the blogosphere, but it’s more important to get the ideas out.) But it does make me reminisce back to the Wild West blogging era, when a bunch of ordinary people could throw ideas out there and have them resonate. One of the most common ways to dismiss libertarian ideas is to make a quasi-strawman reference to Ayn Rand. One problem is that, in my experience, the speaker usually doesn’t understand Ayn Rand’s ideas to begin with, although that’s not really what I’m concerned about here. (Also, she misunderstood and hated us.) A second problem is that even if he does, the libertarian case for something never rests exclusively on anything Ayn Rand said. You can take Rand’s philosophical ideas or leave them, and this has little necessary bearing on whether you’re a libertarian or not. For my money, the best argument for a given libertarian idea usually rests on economics rather than on moral theory. By “best” I mean the one it’s most worth one’s time to defend, because there’s a lot more certainty about fundamental economic laws than about fundamental moral laws. If somebody rigorously defends a particular moral approach, there are other experts who find fault with it and prefer their own. Anybody who’s taken an intro ethics course can attest to this. On the other hand, if somebody defends an idea the implication of which is that demand curves slope upward, for example, you know that he just plain doesn’t know what he’s talking about. Many of the dismissive Ayn Rand references I’ve heard are funny, and may be worth making for that reason. But it also (frequently) shows a refusal to engage the actual libertarian ideas in question. Nobody owes us their discussion time, but we don’t owe anybody the benefit of the doubt that they actually have ideas that are better than ours. I’m certainly free to tell the world I’m a better boxer than Floyd Mayweather and then refuse to fight him when he offers to put my claim to the test, but the world would rightly interpret that as my not really being a better boxer. Our ideas are very much in the minority, so I understand that a lot of people don’t feel it’s worth their time to challenge them. Fair’s fair. But fair’s also fair when we take your quasi-strawman dismissal as evidence that you’re not rejecting well-understood libertarian ideas for better non-libertarian ideas. Bill Maher, I’m looking at you. I’m sure there are ways in which libertarians are guilty of similar kinds of tricks. Feel free to call us out on it if it comes up. Here is a collection of a bunch of pieces making fun of Ayn Rand’s ideas. This weekend I went to the sixth annual International Students for Liberty Conference, and it got me thinking about the state of the libertarian movement. I’ve been a member of this movement for quite a long time; I was enthusiastic enough about libertarianism to join the Libertarian Party on a high school trip to Washington D.C. when I was sixteen. * I’m now thirty, so I’ve been involved for about half my life. First, it’s grown exponentially even during the time I’ve been involved. There were more than a thousand attendees, and the vast majority of them were undergraduates. These are the undergraduates who either found their own travel money or get somebody to pay for their trip; they must represent many more young libertarians. When I first got involved most libertarians had never been in a room with 1000+ libertarians, much less thought of it as an annual event they could prepare for and look forward to. I was “that libertarian guy” in high school. Even in college there were only a few of us. Now, for college undergraduate libertarians, this is an institution. They now seem to know almost nothing of the disheartening loneliness of the earlier days of the movement when a libertarian might not personally know any other libertarians. I can’t overemphasize the novelty and importance of this fact. As a corollary, the movement seems to be shaking off its lingering, historically contingent conservative shackles. Ever since libertarians and conservatives united against the New Deal, we’ve been stuck with them—in the minds of others, and all too often in our own. It’s been a constant frustration trying to explain to people that I consider libertarianism an antidote to both modern conservatism and modern liberalism, which in my mind should be grouped together before either should be grouped with us. Third, libertarian events have always skewed heavily white and male. ISFLC13 was noticeably more even in gender ratio than any general libertarian event I’ve ever been to, and included delegations from across the world. This is also an important sign of the growth and health of the movement. I don’t have specific answers about how to make libertarianism more appealing to Group X or Category Y, but whatever they’re doing appears to be working. All in all, I am very encouraged by where the movement is headed. I admit I had mixed feelings about the influx of people due to Ron Paul. I loved the enthusiasm for humbler foreign policy and smaller federal budgets, but I didn’t feel that the rich intellectual heritage of the movement was really getting its due, and I secretly feared the movement would be drawn off track. I’m not worried about that anymore. This is a sharp crowd. * My LP membership lapsed not long after, for what it’s worth. Some people will read this footnote wondering why I included it, but I’m preempting the others. ** Full disclosure: Bryan Caplan is currently a professor of mine, but I don’t think he will take this as buttering him up.